Danny is in has been in Utah for 8 days now and let me tell you we don't like it at all. Jake walks around the house and looking in all the rooms and saying "dada, knock knock" Jake doesn't talk a whole bunch yet but he can tell a knock knock joke and he thinks it is so funny. I think he thinks that he and Daddy are playing the longest game of hide and seek ever and he is ready for daddy to come out! Danny asked me to send some pictures of what we have been up to. 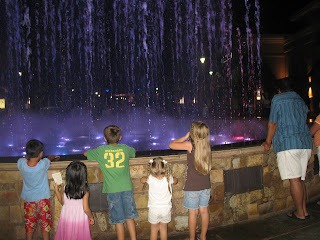 The kids love the new outdoor mall called " The Fountains." 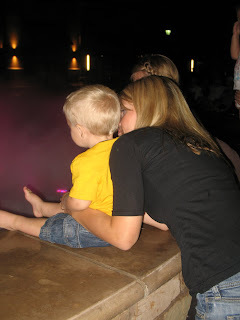 It is a really cute place and has cool water fountains that dances to music and changes colors , there is one that the kids can run through to cool off and they love it. It's better at night so you can see all of the colors. Fun shops but totally expensive so we window shop. Lauren has picked up the peace symbol as her new trademark. She is kind of a flower power girl. 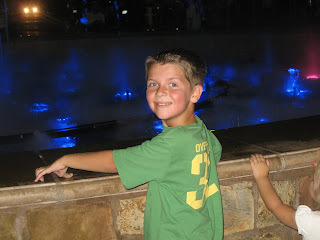 Jake had a great time, he tried his little heart out to get IN the fountains, watching was not enough. He keep saying WOW! 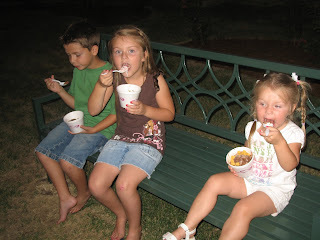 There is a little park area in front of Big Spoon so we got some ice cream and waited until it got a little bit darker so we could go back to the fountains. 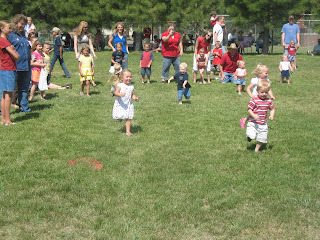 The kids found lots of friends to play with in the park. Someone had brought a huge soccer ball and the kids got a group together to play. 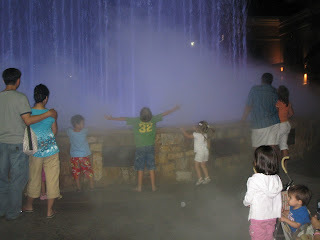 My pictures didn't turn out because it was too dark, but they had a blast. 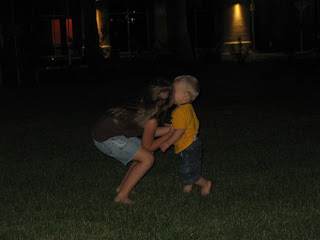 Lauren even stopped to give Jakey a smooch. He was cheering them on from the side lines. 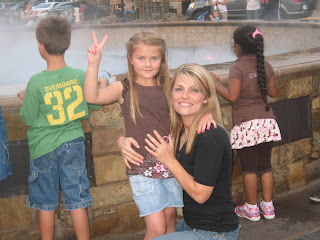 My Mom is Lindsey's second mother. She wants to be with her every where she goes and my Mom loves every second of it. I have no idea what those 2 are going to do without eachother. Lindsey fully expects Grandma to move to Utah with us. 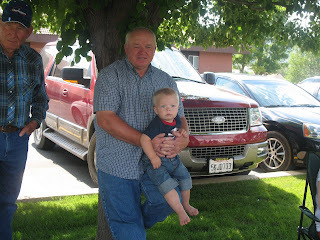 Grandpa and Aydon hanging out. Gary is great with the kids and they love him. He is so helpful to me too! He is always asking what he can do to help. Those are a mom's favorite words! 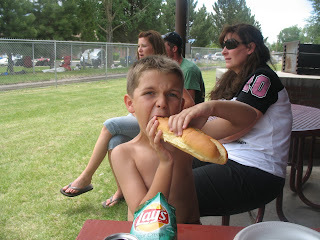 This picture is my favorite! 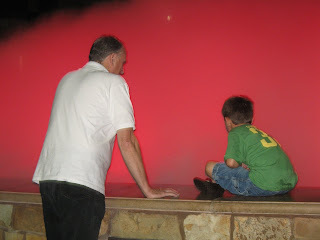 The fountains dance to music and Aydon thought he was the conductor. Right at the end when all the water shot straight up Aydon hit it perfectly. He had us all laughing our guts out! He is pretty proud of his orchestrating! Well we have been trying to keep busy without Danny but it sure would be more if he was here. We miss him like crazy! He has never been away this long and we aren't really sure when he will be back. (Hopefully next week.) We love you hunny! 1. 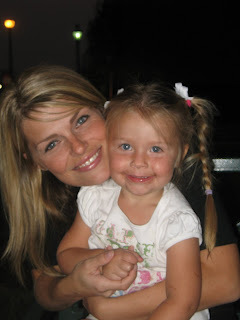 As a comment on my blog, leave one memory that you and I had together. It doesn't matter if you knew me a little or a lot, anything you remember! 2. Next, re-post these instructions on your blog and see how many people leave a memory about you.It's actually pretty cool (and funny) to see the responses. 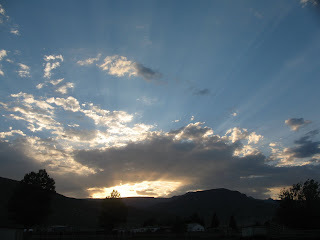 If you leave a memory about me, I'll assume you're playing the game and I'll come to your blog and leave one about you. 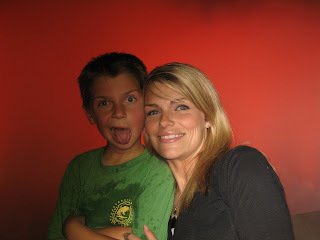 Wow there is so many things I haven't had the time to blog about, end of school parties, scout camp (Aydon loved it!) Jelly Belly factory, but there are a few recent ones that deserve an honorable mention. 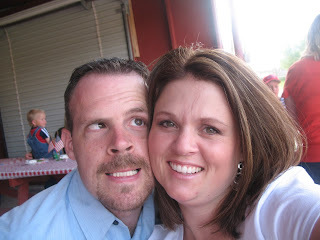 Danny and I celebrated our 10th Anniversary on the 11th of July. I can't believe time has gone by so fast. We were driving home from Utah and didn't have much of an anniversary. ( The picture is from a dinner we went to the previous week.) 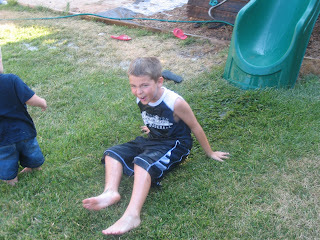 My Mom took the older 3 kids and Jake stayed home with us. We ordered in Tahoe Joes and had a cozy evening with just the 3 of us. We laughed our guts out because we have packed up all of our dishes and have been paper plating it for the past couple of weeks. We left out a few of the kids plastic plates, so I had a princess plate and Danny had super man. I thought that was completely appropriate since Danny is super man to me! He is the love of my life and I am so happy we chose eachother! 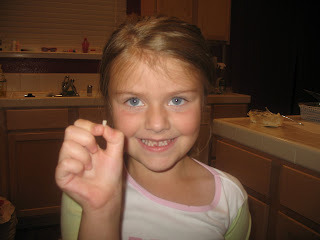 Lauren finally lost her first tooth. It has been hanging on by a thread for a month. We tried having her bite a towel and pulling it out fast and nothing happened, finally Danny did what he has done to Aydon several times. He promises them that he won't touch it, so he tells them to get their fingernail under the back of the tooth and pull down as far as they can until it hurts and them he quickly smacks their hand. The tooth goes flying! She was so excited. She didn't even cry. She ran around showing us all her tooth and put in the bag for the tooth fairy! Accept that night when I looked under her pillow it wasn't there! She woke me up the next morning and said she hoped the tooth fairy wouldn't be made at her, but she wasn't ready to give up her tooth yet. 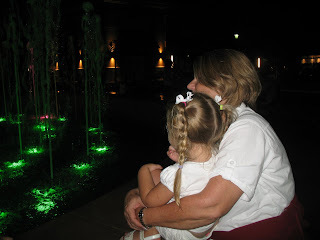 She wanted to show Grandma Debbie and her best friend Ella. I told her I am sure the tooth fairy wouldn't mind! Now these pictures aren't about any big occasion, but they are so special to me. (They turned out terrible though). 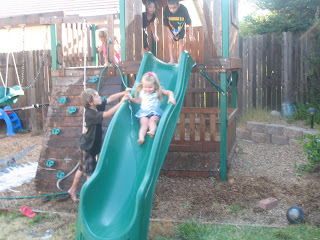 Yesterday we had some of the nieghbor kids over to play. 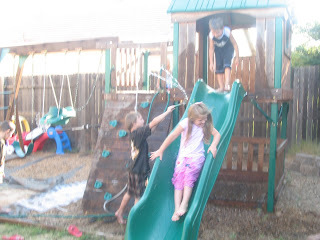 They drug out the hose and put it on the slide and they all got soaked in the regular clothes. They had so much fun. 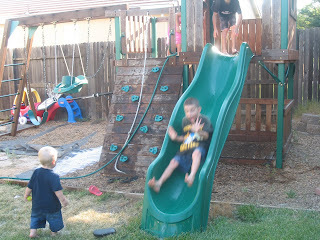 The part that made it so special to me is that I know this is going to be one of the few times left that my kids will play with thier little friends here in this house, in our backyard! 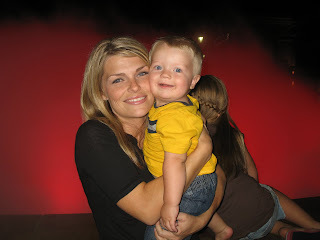 We love our nieghbors and their kids are the best. 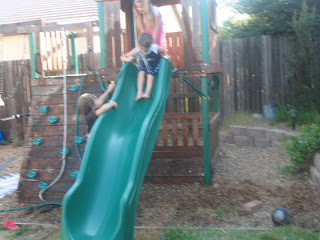 We have been in this house for a little over 6 years and our kids are the best of friends. That is one of the things that will make leaving so difficult. However we know we will stay in touch and see eachother as often as we can. Taylor's family moved in about six months ago and he and Aydon have been buds ever since. Ella Bella is Lauren's Best Friend! 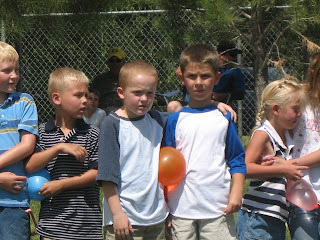 Kole has been Aydon's best friend since they were 2 years old. 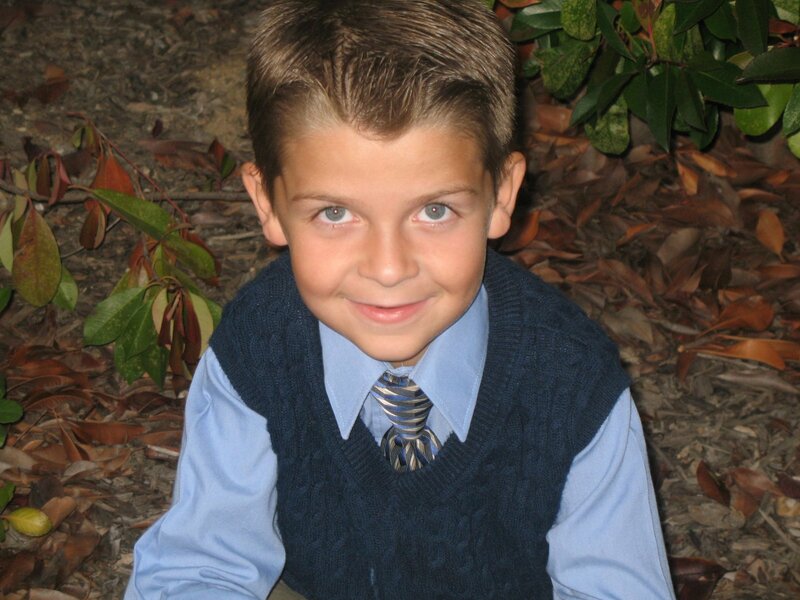 He is such a great kid! Aydon apparently was getting a little thirsty. 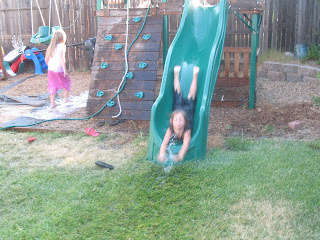 Lauren wanted to go down the slide but didn't want to get wet so she let Kole Know it in true Lauren fashion! 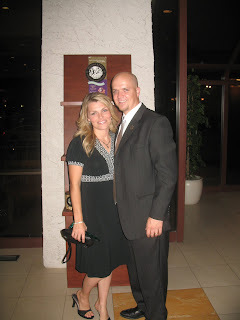 Danny is the love of my life and I am so glad I married him! 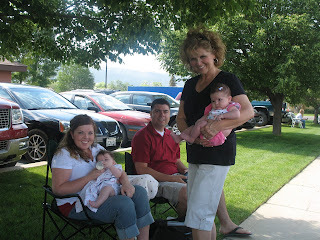 We went up to Utah for the 4th to look around and see where we want to live and in the mean time we had a lot of fun. 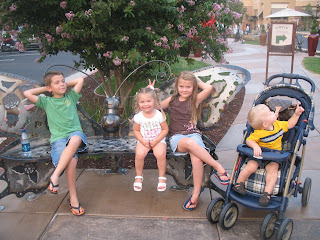 We drove to St. George and Cedar City to check it out and saw some friends we hadn't seen for years. We drove up and down the state and needless to say we are happy to be out of the car. We were in Koosharem for the 4th and loved it. 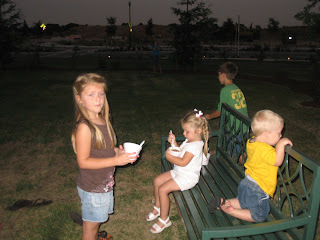 The kids played with their cousins from sunrise to sunset, they were exhausted at the end of everyday. The weather was beautiful. We are looking forward to spending more time there. Danny and Lindy had a high school reunion. 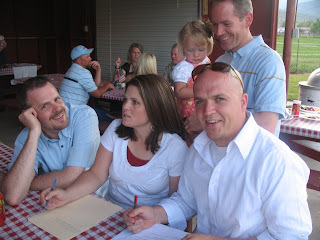 We left the kids (except Jake) in Koosharem with mom and dad Torgersen and had a night out. 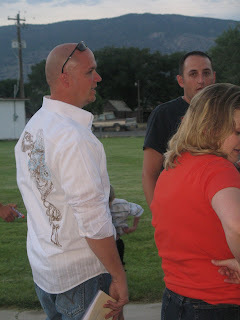 Danny and Lindy had fun catching up with old friends near their old high school in Junction, UT. Danny passed out some funny awards for most changed and unchanged, who was still stuck in the 80's. I was suprised he didn't get that award himself. Jake and I hung out most of the evening. There were alot of kids there and Jake likes to push other kids down, so he spent some time in the stroller. Matt was the photographer for the evening. He got a lot of great shots. This was one of my favorites. The weather was perfect. I love these 2 and I am so happy we got to spend some time together. We don't get to see Matt and Lindy very often and when we do we are usually surrounded by children, so this was a welcome night out with adults. The funny thing was we watched " Meet the Robinsons" in the car on the way to and from! We are all just big kids at heart. Lindsey and Megan played together all week long and they had so much fun! 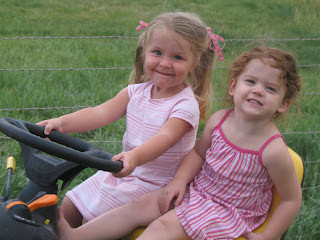 They love to drive Papa Don's lawn mower. Mom is holding baby Ellie, (lindy's 5th baby) Launi has baby Evie. Damian is just looking pretty for the camera. These little girls could make anyone baby hungry. I love them and Evie's little cheeks are edible. 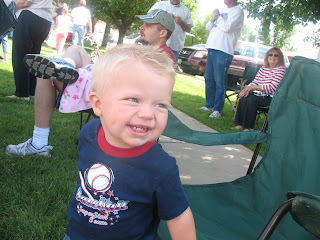 This is Jake at the 4th of July parade waiting for the action to start. Danny's home town is so dang cute. 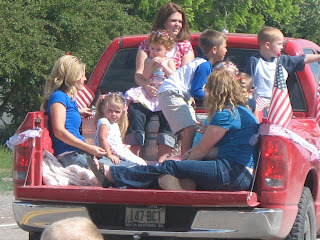 We had a yummy pancake breakfast and then all of the cousins got in the back of Aunt Penny and Uncle Norm's truck and got to be in the parade. The kids threw candy out to the kids watching from side. 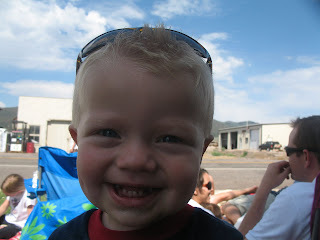 Jake was hanging out with his twin Papa Don watching the parade. 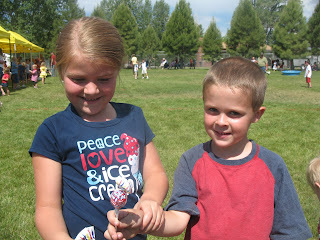 Aydon and Dallin were getting ready for the water balloon race. These to were also inseperable from the moment we got there. They were getting a little hot here. They stared a water balloon fight after this was over. They had so many fun things for the kids to do. 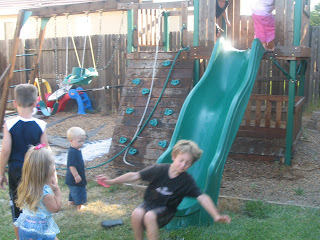 All sorts of games and inflatable water slides. It was great. 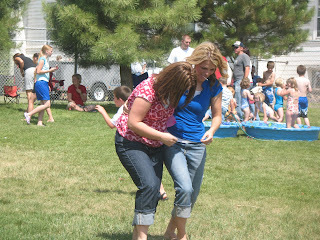 Lindy and I were last place in the water balloon race. We were laughing to hard to walk and we all know what happens when you laugh to hard after having four kids. You have to stop and cross your legs so you don't pee your pants. The kids playing Bingo! 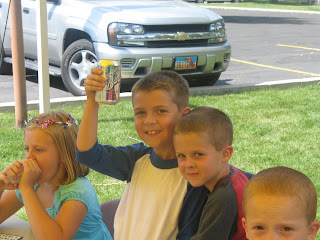 Aydon was so happy when he won because the prize was a cold root beer. His favorite. Lindsey and Bejamin running the 2 and under race. They are so stinkin cute! 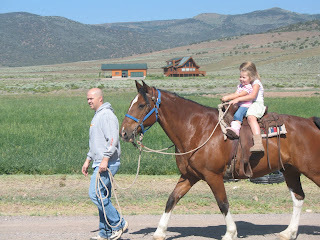 Danny gave all the kids a ride on Toby. 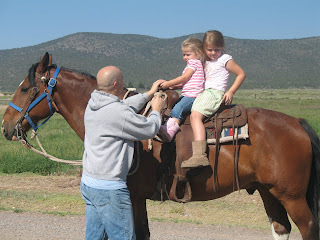 My girls are INLOVE with horses, especially Lauren. Another reason we are so excited to spend more time in Koosharem. They were in heaven. 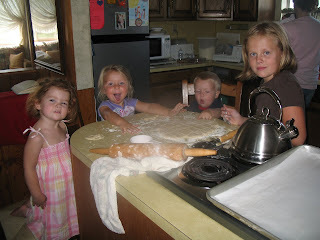 The girls were constantly busy doing something baking cookies (Mikayla baked cookies, everyone else just ate the dough.) These were the BEST cookies and there is only 3 ingredients in them. 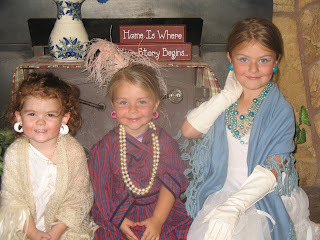 These girls killed me. They looked so dang cute. Grandma has the best dress up clothes ever! Mikayla did their make up and hair and then they did a fashion show for us. Lauren was always posing for the camera. I don't know if you can see the rainbow in this picture. 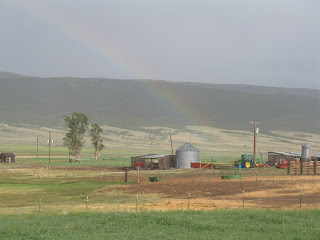 Danny, Jake and I were riding out in the fields on the fourwheeler and it just started pouring on us, within a few minutes it past and then there was a rainbow. It was really pretty over the mountains, not to mention I love the smell of rain on the grass. We had a great trip. 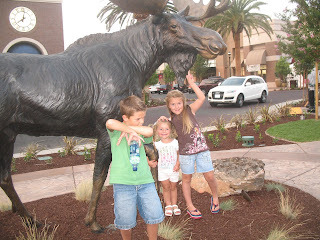 I am going to stay in California with the kids until Danny gets things situated in Utah for us and then we will be off. So for now I am going to enjoy time with family and friends in Smokey California before we move. I was trying to make Utah look as appealing as I could in hopes that any of our friends and family would want to move with us. Any takers?